Welcome. 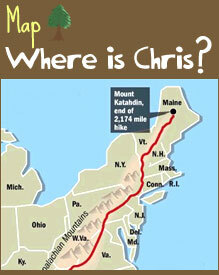 You're about to hop on the Appalachian Trail and become part of the 2009 thru-hike of Chris Hennig, whose trail name was "Feed Bag." While Feed Bag took in all the personal benefits of spending hours alone in the woods (getting in better shape, crying, pondering the meaning of life), there is a purpose greater than that for which he hiked: to make the world a better place for children. And you can be a part of this journey starting now...and help make a difference! Ok, so this is not exactly where I got my trail name. However, it’s hilarious, gross, and completely satirical. Enjoy, then read on! It’s hard to believe that three months ago I was easily hiking up and down mountains for 17 miles/8-10 hours a day. It seems like such a distant world now. I do miss exercising all day long. I’ll confess I’ve been rather lazy now that I’m away from the trail. I’m sure a few of the 40 lbs have snuck back on being that we have catering here on the road three meals a day, not to mention bus food every night. I’m a little disappointed that NO ONE has contacted me for help in planning their March 2010 departure on the Appalachian trail. Come on people…you only have around 3 months left to plan Who is going to thru-hike next year? Lastly, I’ve filmed a new video containing the gear I used during the summer months of the trail. I’ll be posting that soon as well as a summary blog containing the expenses incurred while hiking. I’m dreading that one..
Hope y’all are doing well. Dare I say…I miss having a Trail Report here at the end? Hey Chris. A friend of mine is getting ready to hike the AT! She’s going to do it through the winter…brave, or crazy? Wow! Found your videos on Y-T, which is how I found your site. First off, we can’t thank you enough for the gear review video. What might only have seemed like ten minutes away from the festival for you was a gold mine pf information for us. Me and wifey are planning a thru-hike for 2011. We do a lot of outdoors stuff now, camping, etc. But it was only about a week ago that the A-T bug jumped up and bit us. And unfortunately, we just can’t get away from the university and away from work soon enough to do it in 2010. We haven’t had time to read over your entire site, but I’m really looking forward to doing so. More importantly, if there is any way we could ever trouble you with some questions, please let me know. We have about a million questions, but we’ll try to limit it to only a hundred or so. I had to enter my email address to post this, so it should be available to you. Again, thanks so much for sharing your story. Can’t wait to read (or watch) the rest of it! Just recently found your web page and have really enjoyed reading about your journey. contacting you about planning their March 2010 thru-hike. We are planning a NOBO and would like some advice,or any information you might be able to give us. Look forward to hearing from you and reading more on your web page.